Citrus in California is like zucchini in the midwest: abundant. In North Dakota, where I was raised, folks will warn you to lock your car in late summer for fear of finding bags of squash when you return. 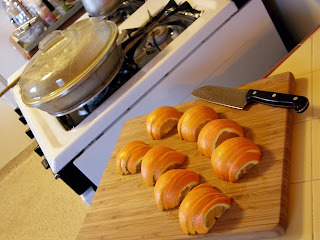 We're lucky to have a neighbor who leaves bags of oranges on the handle of our back door from time to time, and at this time of year, if we're not snacking on them or juicing them, we make a few pomanders to place around the apartment and some candied peel or orange slices. 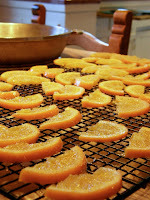 I like to make batches of these candied orange slices and keep them handy for everything from cookie platters to garnishing salads, desserts or meat dishes. 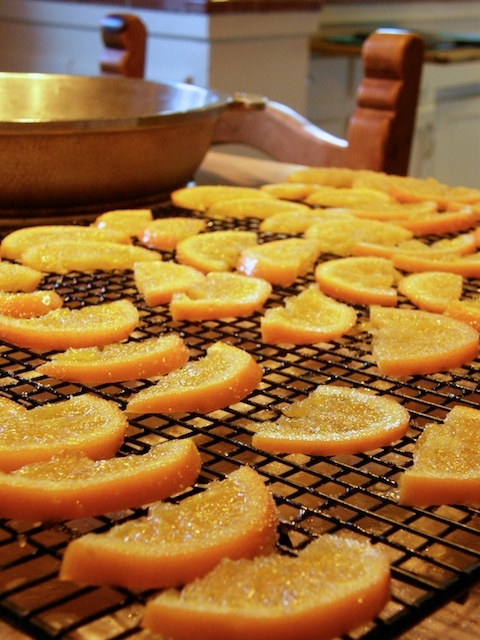 Candied slices won't keep as long as dried peel, but the method preserves more of the orange (and doesn't require as much drying time). 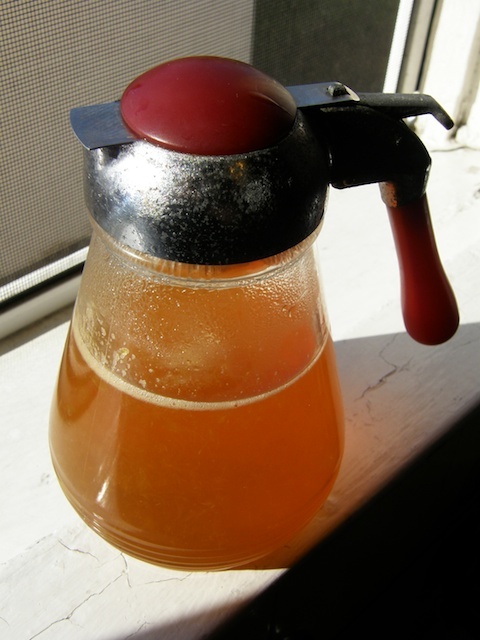 This simple recipe can be multiplied as you wish and can be used with grapefruit or lemon (adjust sugar to taste). I candied four oranges using the large Guardian Service fryer and reduced the remaining syrup for drizzling on pancakes or yogurt or mixing into cocktails or marinades, etc. 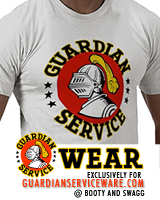 In a Guardian Service fryer, combine the water and sugar and bring to a boil. 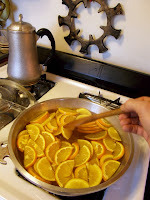 Add the orange slices and cook over medium heat, turning occasionally, until the liquid is reduced to a thin syrup and the orange slices are translucent, about 20 minutes. 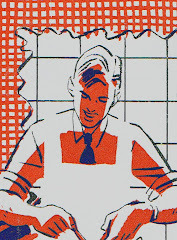 Reduce heat to medium low and simmer until the syrup thickens and the slices are tender but still intact, turning occasionally, about 10 minutes. Transfer the orange slices to a rack to cool. 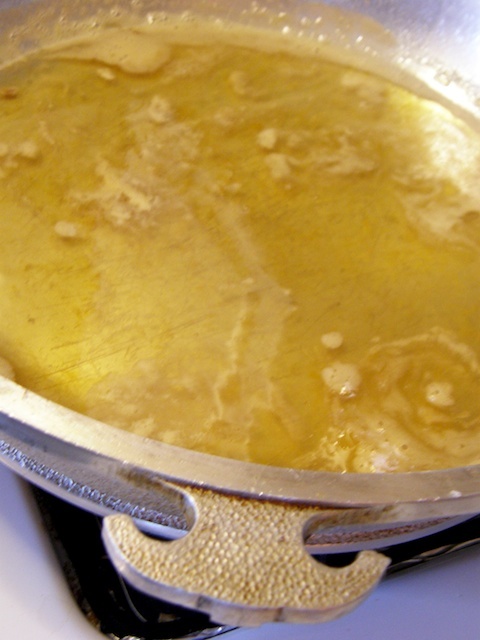 Further reduce syrup to desired consistency and reserve for another use. The candied slices can be refrigerated for up to 2 weeks.